The Total Solar Eclipse of 24 October 1995. The dark blue region is the Path of Totality (also known as the Umbra). The umbra shadow travels from west to east (left to right on the map). At the point of Greatest Eclipse, totality is at local midday. The duration of totality at greatest eclipse is 2 minutes 10 seconds. This occurs in the South China Sea. On either side of that point, the duration is less. To the West of greatest eclipse the eclipse will be total before local noon; to the East, the eclipse will be total after local noon. The umbra is widest around the time of greatest eclipse as the surface of the Earth is bulging out towards the Moon in that region. The area on either side of the path of totality (in pale blue) provides a partial eclipse, the magnitude decreasing with distance from the path of totality. Outside the blue region no eclipse is visible. The Sub-solar Point is the location where the Sun is overhead at the time of greatest eclipse. The overhead Sun is South of the equator during October. The red regions are the areas where the eclipse occurs during sunrise (left) or sunset (right). The path of totality begins in Asia (central Iran), crosses South Asia (including the Bay of Bengal), South East Asia, the South China Sea and the Pacific Ocean. The umbra takes 3 hours 20 minutes to traverse its entire path. The Moon is further from the Earth than average making the path of totality narrower than average and the duration of totality very short. 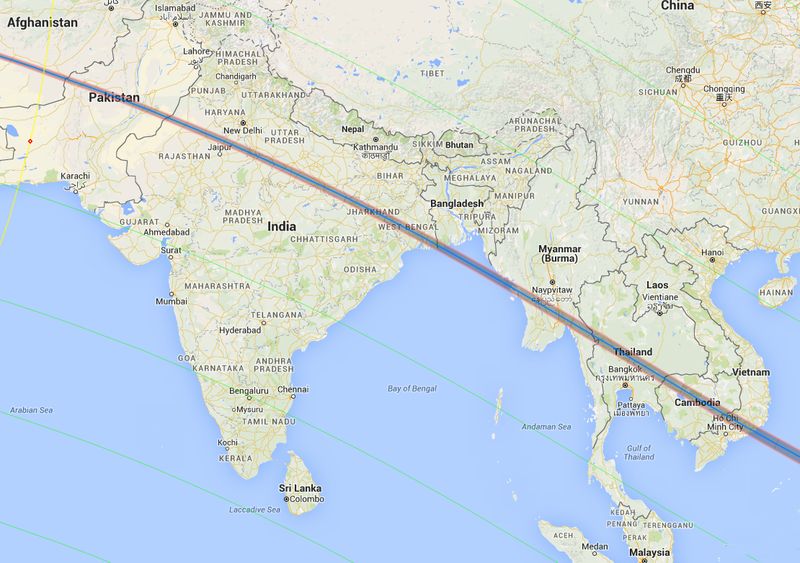 The Path of Totality is the dark band in the centre, moving across Asia from left to right. In this part of the path the eclipse occurs before local noon. The path travels across Iran, Afghanistan, Pakistan, northern India, the extreme south of Bangladesh, Burma, Thailand, Cambodia and Vietnam. It takes about 1 hour 30 minutes for the umbra to cross this land area. The dark band is the Path of Totality. The blue line is the Centre Line of the path. The duration of the eclipse is longer the closer the observer gets to this line. The path passes South of the city of Agra (famous for the Taj Mahal) but passes over the ancient city of Fatehpur Sikri. 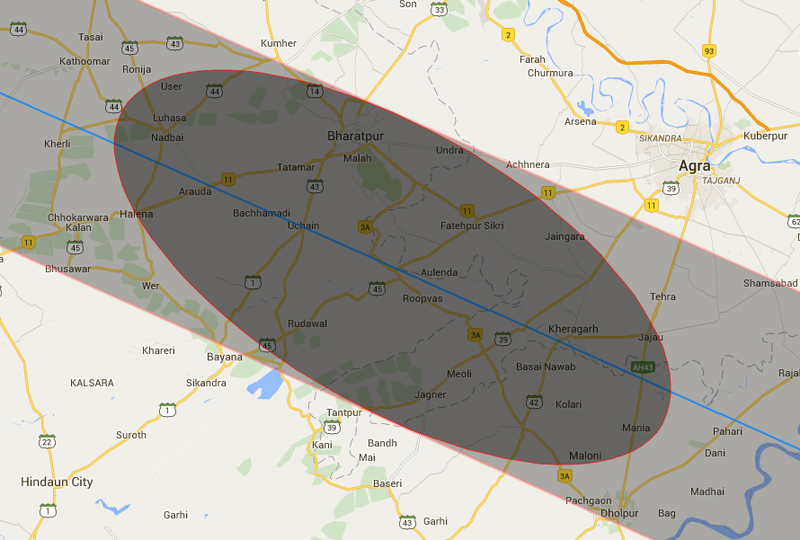 We were based in a guest house in Agra but the eclipse site was along the centre of the path of totality approximately 35km South West of the city of Agra along the Fatehpur Sikri road. 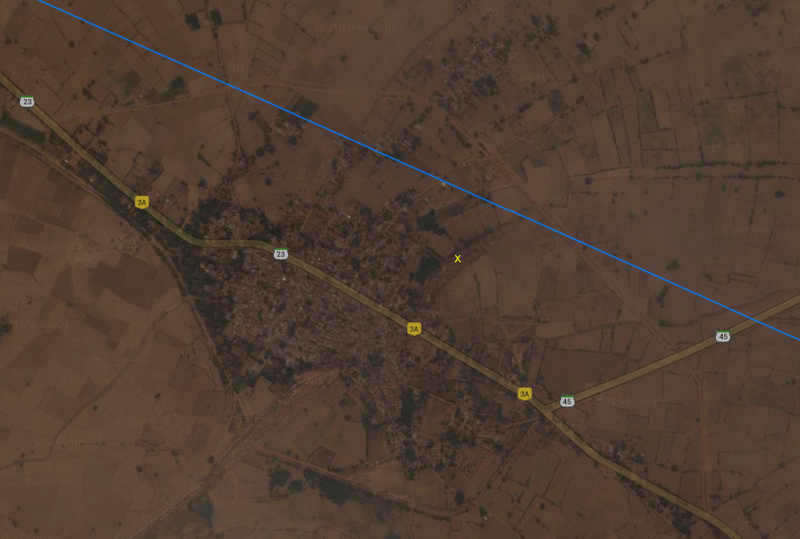 The elliptical area is the shape of the umbra during mid-eclipse at the eclipse site in the village of Khanua South West of Fatehpur Sikri on the Centre Line (in blue). The umbra is 95km by 42km. This is the village of Khanua, a few hundred metres from the Centre Line (in blue). We spent the night before the eclipse in this village. The eclipse site was a small ridge next to the village, marked with the yellow X. This is the sky during totality close to our observation location. The Sun is very low as the eclipse was early in the morning. Venus was the only planet visible. The Location, Latitude and Longitude are for the observation site. This was determined by plotting the path of totality using data obtained from Fred Espenak onto a good quality air navigation map. The Distance from Centre Line was a few hundred metres. First Contact is the beginning of the eclipse when the first "bite" appears on the Sun's disk; it is the beginning of the partial phase. Second Contact is the beginning of totality. Third Contact is the end of totality. Fourth Contact is the end of the partial eclipse - at this time we had left the observation site and were talking to the villagers. The times are in local time which, for this eclipse, is UT + 5.5 (GMT plus five and a half hours). The Duration of the eclipse at the observation site was 0 minutes 54 seconds. The Path Width is the width of the path of totality. This was quite narrow for this eclipse, at 43km. The small size of the umbra produced a fairly bright totality and a short duration. The umbra itself is very elliptical in shape. The Major Axis is the longest axis of the umbra; the Minor Axis is the shorter axis. The umbra at the observation site was 95km long and 42km wide. The Umbral Velocity is the speed of the Moon's shadow which was 1.9 kilometres per second at the observation site. This high speed and the small width of the umbra produced a total eclipse of short duration. Gamma determines how the Moon's shadow, if extended, would pass through the Earth. A Gamma of zero implies that the shadow would pass through the exact centre of the Earth. A Gamma of greater than 1 misses the Earth and no total eclipse would occur. A positive Gamma passes North of the Earth's centre; a negative Gamma passes South of the Earth's centre. The value of Gamma for this eclipse is 0.3518. This means that the shadow passes North of the Earth's centre, about a third of the way to the edge of the Earth. This, combined with the fact that in October, the Southern Hemisphere is tilted slightly towards the Sun, produces an eclipse in the Northern Tropical Zone. The Diameter Ratio determines how much bigger the Moon's apparent radius is than the Sun's. In this case, the Moon's radius is 1.012 that of the Sun's. A total eclipse can only occur if this figure is greater than 1. The Moon would then appear larger than the Sun and could cover it completely. If this figure was less than one a total eclipse could not occur because the Moon would appear smaller than the Sun. According to this figure, the Moon is a mere 1.2% larger than the Sun. This produced an eclipse where the inner levels of the Sun's atmosphere (the chromosphere) could be seen. The Magnitude of the eclipse (1.006) is the fraction of the Sun covered by the Moon. For a total eclispe this figure must be greater than 1. The Saros is a collection of eclipses belonging to a series. Each member of the series is followed by a similar eclipse approximately 18 years, 11 days and 8 hours later. This eclipse is a member of Saros number 143. It is the 23rd eclipse out a series of 73. Saros 143 began with a small partial eclipse in high northern latitudes on 7 March 1617. There followed nine further partial eclipses. 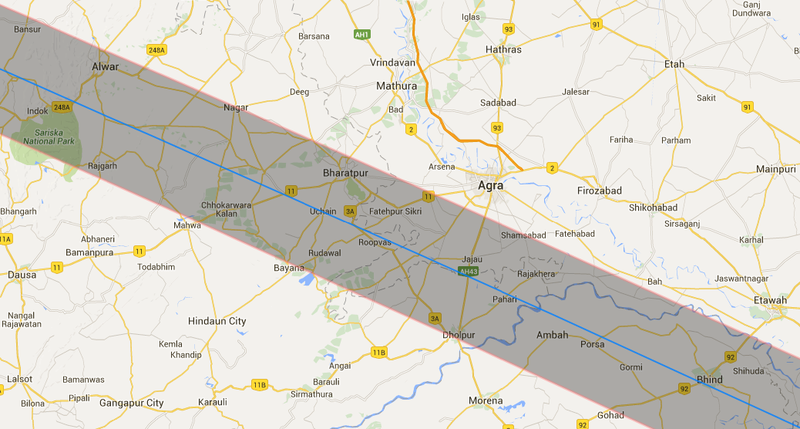 The first total eclipse took place with the 11th eclipse of the series on 24 June 1797 (duration 2m 47s). The subsequent eclipses had longer durations until the longest total eclipse of the series occurred on 19 August 1887 (the 16th eclipse, duration 3m 50s). After this the duration of totality decreased as the Moon was moving away from the Earth for each successive eclipse. This eclipse (the 22nd) is the final purely total eclipse of the series (maximum duration 2m 10s). The next four eclipses will be hybrid - that is annular over part of the path and total over the rest of the path. Kryss saw the 24th eclipse of this series on 3 November 2013 in Uganda. The first purely annular eclipse will be the 27th on 16 December 2085, with a duration of 0m 19s. The duration of the annular eclispes will increase until the 51st eclipse (6 September 2518, 4m 54s). The 52nd eclipse will be the final annular eclipse of the series. There will then follow 20 partial eclipses of decreasing magnitude in the southern polar regions until the final eclipse of Saros 143 on 23 April 2897. The series will end 1280 years after it began. The 1995 eclipse main page. Maps of the path and a diagram of the sky at totality of the 1995 eclipse from Fred Espenak and eclipse details at the observation site. A group photo of the people at this eclipse. Accounts and photographs of the 1995 eclipse sent to this web site are reproduced here.